I had signed up for newsletters from this company a short time ago and around Memorial Day they were having a special on shipping, so how could I resist? Now, I know you some of you are wondering why don’t I just make my own candles since I make tarts. You see some oils simply do not work in soy wax. You can measure everything out correctly, make them, go burn them and notice that there is nothing. Then there is the fact that some fragrance oils work in the soy but are not soap safe and vice versa. So, I try to purchase those oils that I like, are soap and candle safe and have good results in soy. Our house is only so big to keep my stash of hobby materials. I would need wicks, molds, and more oils and I think know we would be bursting at the seams. With summer here, I wanted some fruity scents to fill the house. I knew I wanted something strawberry so in my basket went a Strawberry Preserves ( ah…strawberries) candle, then I thought I would toss in two tarts to try – Lemonberry Crumble and Wildberry Jubilee were the lucky winners. Shipping was within the time frame that was stated on the website. I am guilty of being impatient waiting for my box of goodies to arrive. The day the box did arrive, my mailbox never smelt better. The first to be used was the lemonberry crumble tarts. mmm… they smelled soo good and were really, really strong. One little cube was able to fill our family room without a problem. I was burning them in our computer room and bedroom, the house was simply filled with this wonderful fragrance. Next up, wildberry jubilee again a winner! I have yet to burn the strawberry candle; I need to finish burning another candle first. That candle smells just like fresh ripe strawberries, I know I am in for a treat with that one. I am really impressed with the products from Front Porch Candle Co. They offer container candles, tarts, grubby candles, votives and some really cute kitchen tarts. When you check out their site notice that you even have the ability to go back and rate the fragrance(s) that you tired. Now to me, that is a really great feature. 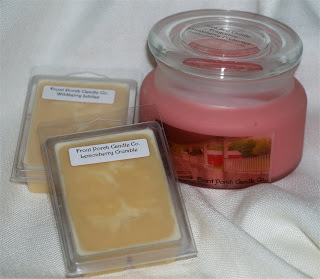 When you are looking for some awesome soy candles or tarts, do give Front Porch Candle Co. a try.